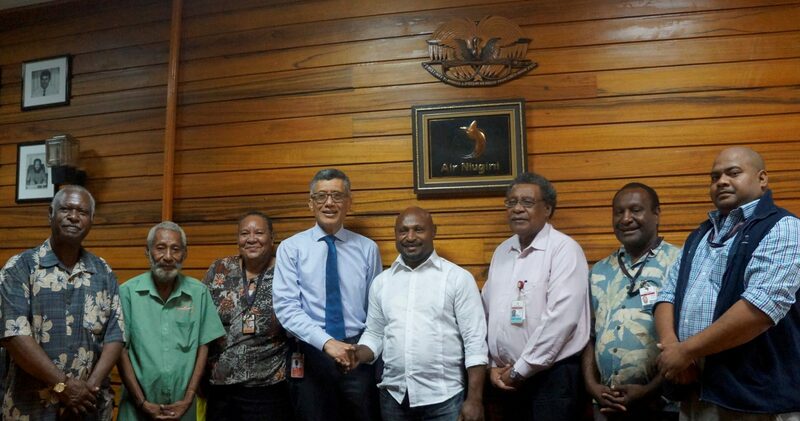 Chief Executive Officer of Air Niugini, Mr Simon Foo has congratulated the new National Airlines Employees Association (NAEA) executives and said that the airline’s management looks forward to maintain the excellent working relationship with the Union. The new NAEA executives are Samson Nul (President), Michael Kepa (Senior Vice President), Christine Temu (Junior Vice President) and Mea Willie (Treasurer). In his congratulatory message to the newly elected executives, Mr Foo also thanked all the NAEA members who have worked tirelessly to process and handle the various disrupted flights during the last week. The National Airlines Employees Association comprises the largest group of staff who look after the various airline operations throughout its network in sales offices, flight operation, engineering, security, traffic and airport check-ins, flight catering, cargo handling, porters, drivers and general administration. Mr Foo said that the airline acknowledges the commitment and loyalty of all the members of the NAEA. He reiterated that the continued service and ongoing improvement of the national airline rests on each and every management and staff working together as a team to deliver its mandate to the travelling public. Following the temporary set- back to its services, Air Niugini’s flights are operating on time as per the revised schedule and the disrupted passengers should also be all cleared by today’s end.